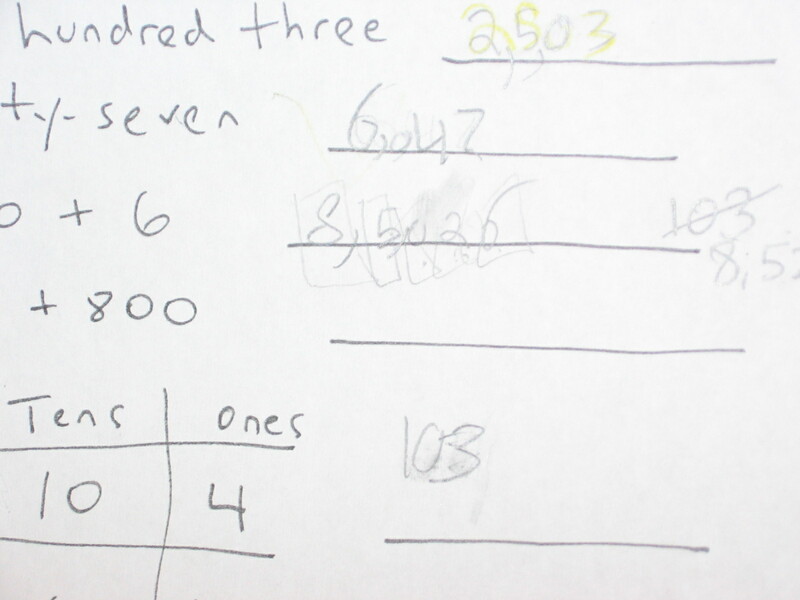 The question that this kid was grappling with was to write “8,000 + 500 + 20 + 6” in standard form. I’ve forgotten most of the details of the conversation, but all of the interesting stuff is right there on the page. First, note how she first writes 25,03 to that first question, at the top of the image. And though it’s harder to see, she’s done that for 60,47 as well. When I came over to her, I thought that she was just confused about the convention, and I offered a correction. Then she started working on the “8,000 + 500 + 20 + 6” problem. First she wrote 26, and then she tried to figure out how much more it was. She ended up with what you see in the image, at which point I realized that there was something about the way she was thinking that I hadn’t anticipated. She was chunking the number into 26 and everything else. She really struggled to figure out what to do with 8,000 and 500. The boxes around the numbers are part of my attempt to push her to tell me what each numeral represented (“5 whats? Shouldn’t this just be 8 plus 5 plus 2 plus 6, so 21?”). But there was no way that was going to work. The fact that she was chunking “26” together means that she doesn’t really get place value for 10s either. Those of you with more experience will hopefully help me out in the comments, but I’d imagine she sees 26 as a single number, not as composed of any parts. This was confirmed when I asked her what the 2 in the 26 meant. She thought I was nuts. She said that 26 is the number right after 25. I repeated the question, and she thought it was ridiculous. To me, this really speaks to the value of activities that defamiliarize place value for students. See Anna’s Ba-na-na or Christopher’s Orpda for activities that do this.